Lighting controls, including Richmond VA home theater lighting, add a dimension to home automation that many of our customers don’t really appreciate until they have actually been installed. While most homeowners love the idea of being able to control with the touch of a button, many don’t realize what kind of safety and convenience they can add until we show them a few options. While the usual applications behind Charlottesville lighting controls include automated times to turn lighting on and off, as well as pre-programmed dimmers, the design team at Appalachian Home Technologies can help you do so much more. For example, we can tie lighting systems into key code entries, ensuring that each occupant can have their lighting set in the way they prefer upon entering the home. Additionally, central lighting systems offer a great blend of technology and aesthetics, making your Washington DC lighting controls something that will impress neighbors and visitors time and time again. Simple pre-set options can also be used to protect your home while you’re on vacation, and help you lower energy costs month after month. 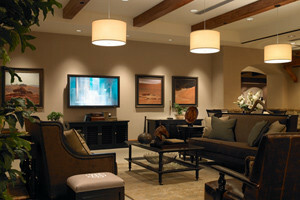 And of course, we can use Fredericksburg home theater lighting to enhance the quality of every viewing experience. That’s because we have settings that work for movies, television, sporting events, and other media room activities. Best of all, they can all be adjusted to meet your personal tastes and preferences. It only takes a moment to show you how a change in illumination can lead to a new perspective on home automation. Contact AHT today to learn more about Richmond VA lighting controls and see how they can add to your safety and comfort.